Situated in the Cardamom Hills region of the Western Ghats, the Periyar Wildlife Sanctuary is one of the most popular wildlife reserves in India. It is home to a great variety of game, including elephant, sambar, wild pig, mongoose, the Malabar flying squirrel and almost 300 species of bird. Leopards and dwindling numbers of tigers are also here, but are, unfortunately, rarely glimpsed by visitors. 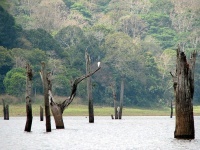 Most people view Periyar from a boat on the lake; however, many visitors prefer to explore the area on foot. Local guides take small groups on treks of various lengths. Exploring on foot should be avoided in the weeks immediately following monsoon season, when leeches make hiking virtually unbearable. The best time to visit is from December to April, when the dry weather draws animals from the forest to drink at the lakeside. Periyar is also a good base for day trips to visit the local tea and spice plantations, and to explore the waterfalls and appreciate the fine views of the Cardamom Hills.